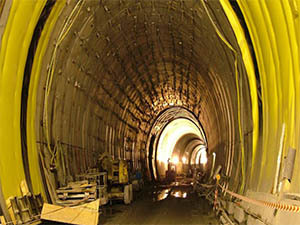 A waterproofing system has the task of protecting the tunnel construction against damage from moisture or unintentional entry of water as well as the danger posed by aggressive water or soils and effects of chemicals. Geocomposites, geosynthetics which are a combination of any of Geotextiles, Geogrids/Geonets, Geomembranes. Geogrid is a grid like geosynthetics product manufactured from p.p / polyester polymers coated with PVC. Geomembranes Essentially impermeable sheets produced from polymeric materials. Geobags are manufacturing from woven or non-woven PP or polyester yarn and are used for slop protection ,river bank embankment , soil erroision. Gabbion are manufacturing from PP rope or PVC Coated G.i wire filled with boulders to construct retaining wall , embankment , shore protection or other similar application. Geonets are discernibly stiffer than geotextiles and have relatively large voids within the material. "Gayatri polymers & GeoSynthetics is a dedicated team of civil engineering, polymer engineering & geo tecnical experts committed to provide abslute solution for civil enginreening and environmental issues using specially made geosynthetic products."